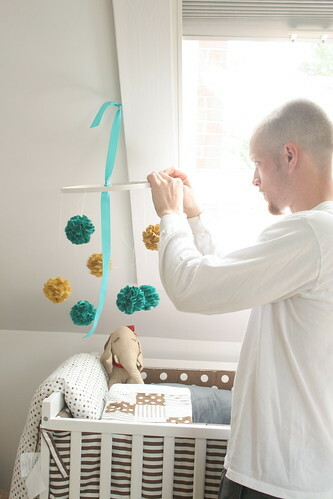 DIY Fabric Pom Pom Mobile & A Winner! Happy Monday! We had a great weekend filled with family and friends, and today I begin training the girl who will cover me while I'm off on mat leave for the next year. The count down is officially on. Only 13 more days of work... Nutso! Before I announce the winner of my Ramsign giveaway, I wanted to share with you a project that I've been working on for a little while now. 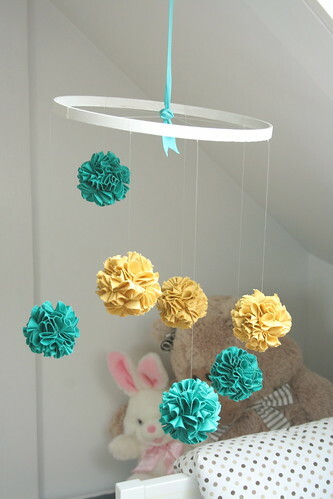 A DIY mobile for the Peanut's nursery. I got the basic idea from this tutorial over at once wed for DIY Fabric Poms - and made a few adjustments so that it would work for me. Step 1: I took the inside of the embroidery hoop and painted it white, as I wanted the pom poms to stand out, and not the hoop itself. ... Trust me... you'll cut WAYYYY more circles than this. I'm saying you need somewhere between 40 and 50 per pom-pom (of course depending on the size of your styrofoam balls). 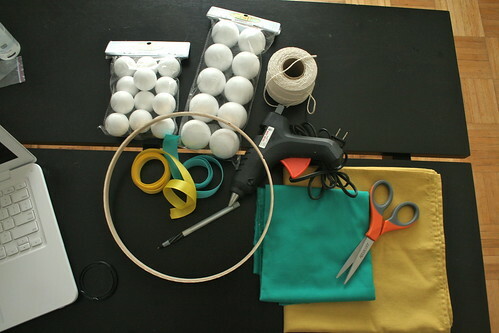 Step 3: Once your little circles are cut, you can begin gluing them onto your styrofoam balls (or whatever round object you choose to use). 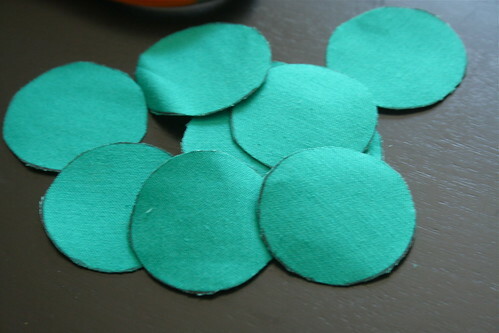 As per the tutorial, fold each circle in half, add a small dab of hot glue on the flat side of the circle, near the bottom and fold in half again. 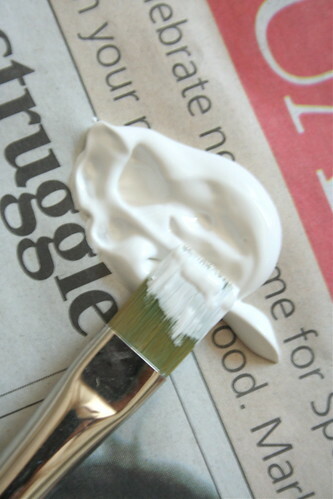 Then add a small line of glue along the folded edge of your circle and apply to your styrofoam ball. Then glue away. You'll find your own pattern and way of gluing on your little fabric pieces to make the pom pom look right. I started off putting them too close together, which I found didn't make it look fluffy enough, so I started to space them out more as I went. Step 4: Before you ball is full of fabric, put a small dab on hot glue directly onto the styrofoam ball and insert one end of fishing line. Hold it in place until it dries and cut fishing line to desired length (we found that longer was better so we could adjust the length when we were ready to attach it to the hoop. 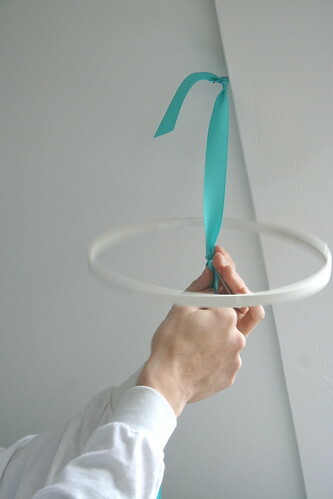 Step 5: Take your fishing line and tie it across the hoop to create quarters. (I probably should've taken a photo of this step... but of course neglected to. My apologies. I blame the baby brain for that one!) We made sure to tie it nice and tight, as this is how we planned to hang it. Once tied, we used a small amount of hot glue to ensure the fishing line was firmly attached to the hoop and wouldn't slide. Step 6: After putting a screw into the window frame over the foot of her crib, B used a ribbon to hang the hoop. 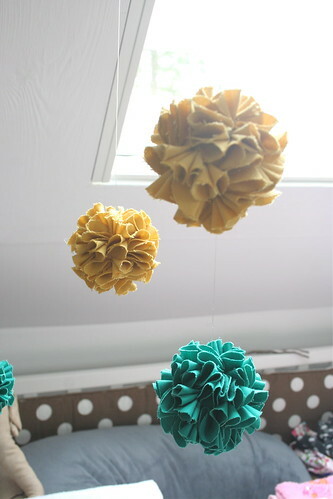 Step 7: Tie on the pom poms at alternating heights until the hoop is balanced. 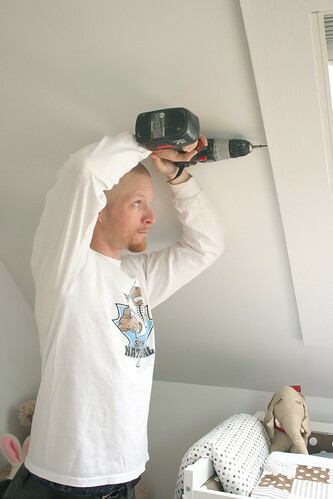 Don't tie them on too tight, as you may need to slide them around a little to get everything balanced properly. We're starting to feel pretty ready for this little peanut to arrive, and have another update to share later this week (hint: artwork has started to go up on the walls!). Yup... things are starting to feel pretty real, and that's a good thing as my due date is just a little over four weeks away. Wow! Now, the moment you've all been waiting for - the winner of my Ramsign giveaway! Thanks so much to Ramsign for offering up one of their signs for one of my lucky readers, and thank you to everyone who participated! We had a total of 15 comments left, and after using random.org to generate a winner (between 1 and 15) we came up with lucky #4! Congrats to Hilary over at My So Called Home! Lucky Hilary is actually in the process of buying her first house and I hope that this pretty little sign is the perfect addition to help turn your new house into a home! I'll contact you with details on how to claim your prize! I love it! The colours are gorgeous and I love the way the folded fabric looks! Looks cute - love the colours. Now you can enjoy your last pre-baby weeks relaxing! Yay my first giveaway win! Thanks so much :) The nursery is coming along great, I can't wait to see it all finished. Seriously adorable! I love the colors! Fabulous! Love the colors... so super cute. Kerry, that is adorable! Four weeks, wow, so excited for you. :) Enjoy every minute, it is really one of the most amazing times, before, during and after. That is so flippin' cute! I love it. 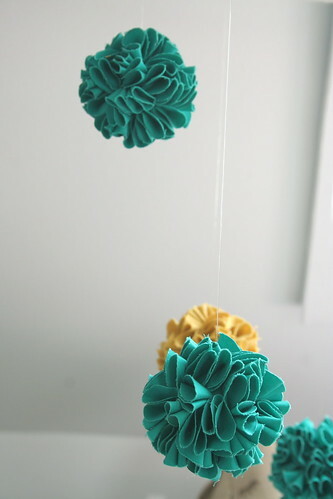 I made ONE fabric pom similar to that for my sister's baby shower - those babies take for.ev.er. Nice work. 4 weeks to go!! YAY. Thanks so much ladies! :) We're so thrilled with it... now we just need a little peanut around so that she can enjoy it too! yay Kerry, great job, it turned out amazing!! Great job, it is so cute! 4 weeks to go you must be so excited! The mobile turned out so pretty! Enjoy being off work and nesting...it is such a special time. Kerry, it looks fantastic! And it looks like a lot of work - but totally worthwhile :) Love the colours and the soft look of the pom's. It's beautiful! I'd like to make one for my daughters room. What kind of fabric did you use? Just wondering how big were your circles actually? Hi Koryn! My circles were roughly an inch and a half! I traced the lid of my paint bottle, and they were absolutely perfect! This looks great. Do you happen to have any photos of step 3 or a link to the tutorial? I am a wee bit confused on the folding and gluing part. Thanks very much!! I love the way this looks! I've got a little less than 4 weeks until my bambino shows up, and the mobile is about the last item I have on my ToDo-for-baby list! Thanks for sharing! Nursery Week - That's What Daddy's Are For!